At AUBG our innovative teaching style means we change lives and open new worlds for our students. But we also make a lasting impact in the wider community through our civic engagement activities. Grassroots action, meaningful local partnerships and a focus on community & social responsibility give our students an appetite for making a difference. We believe that by inviting students to engage wholeheartedly in this way they are able to think of themselves as active citizens of the town, the region and the whole world. Orphanages, elderly people, the underprivileged and those needing help with medical treatment for illnesses are among those helped by AUBG students, who get involved year-round to raise money for a wide variety of causes. The Better Community club and AUBG Bon Appetit club give students the chance to use their creativity to fundraise via initiatives like concerts, bake sales, workshops and free English lessons. Students also make difference by looking after the local environment. 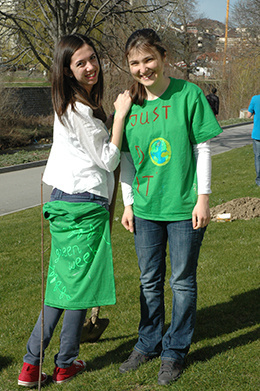 You’ll find enthusiastic student teams mucking in to clean up around urban areas and along the Bistritsa river. Planting new trees helps increase green space and encourage reforestation, as well as adding to the natural beauty of the area and the enjoyment of generations to come.